Religious Texts and Folk Tales as Early Children's Lit? Before the 16th century, there were no books for children. Children learned to read and then read religious texts or books written for adults. There was no real distinction between writing for children and writing for adults because there was no need for such a distinction. The earliest books that could be conceivably written for children were concerning religion or were collections of traditionally oral folk and fairy tales. While not expressly written for children, as these stories were also thought to be of interest to the elderly, in 1634 the Pentamerone, a collection of folktales from all over Europe, was written by Italian poet Giambattista Basile. The Pentamerone, or The Tale of Tales, contains the earliest known versions of both “Cinderella” and “Rapunzel,” two fairy tales that have endured and thrived in present time with some help from Disney. Sixty years later Charles Perrault would also publish fairy tales in French, though they were not as acclaimed by readers and critics of his time as Basile's tales. However, his stories too have managed to survive the evolution of popular culture. He was a major inspiration for the Brothers Grimm and his stories, mixtures of his own imagination and existing folk tales, include Puss in Boots, Little Red Riding Hood, and Sleeping Beauty. When writers eventually did turn to writing books solely for children, entertainment was not even a consideration. Books for children were written with the express purpose to instruct and educate them on some aspect of moral or social life. Small chapbooks were created to teach children specific prayers or parables. Hornbooks were created for the same purpose. 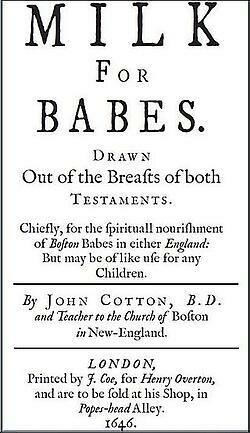 Puritan John Cotton wrote one of these early books in 1656 called Spiritual Milk for Boston Babes, making this early catechism the first children's book published in America. The catechism contained 64 important questions and answers regarding the proper way to live and behave in order to not anger God. This book was considerably shorter than the 100 question catechisms being written for adults at the time. 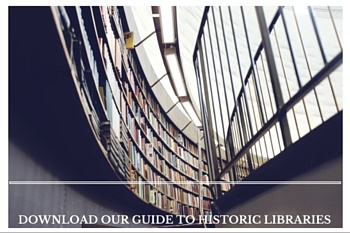 The book was published in both Boston and England and was eventually absorbed into The New England Primer—America's first text book—which remained popular and in use through the nineteenth century. Only two years later in 1658 the Orbis Pictus by John Amos Comenius—the Czech philosopher widely considered to be the father of modern education—was published. 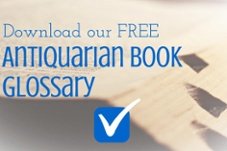 While today the definition of children's literature excludes books not meant to be picked up and read in order, like dictionaries and encyclopedias, Comenius's Orbis Pictus, which translates into The Visible World in Pictures, is notable because it is the first picture book written for children. 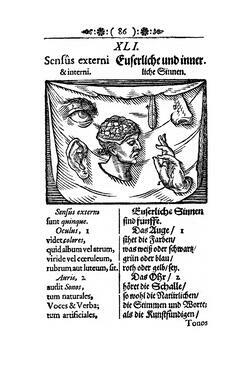 Orbis Pictus is separated into chapters, each with woodcut illustrations on topics like religion, botany, and zoology. The book has had a lasting impact on education for children, as it is the first book to combine illustrations with text as an approach to learning. The first true children's book is believed to be A Little Pretty Pocket-Book, a small book that is quite normal and traditional by today's standards, but in 1744 was groundbreaking. 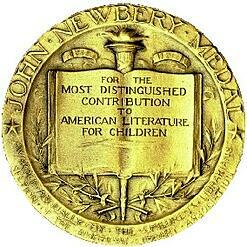 John Newbery, wrote the colorful, child-sized book purely for the enjoyment of children. The book contained simple rhymes and charming illustrations, each focusing on a letter of the alphabet. In a marketing move seemingly well before its time, the book came with a pincushion for girls or a ball for boys. 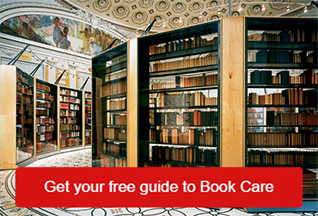 A Little Pretty Pocket-Book is widely considered one of the most important books in the genre of children's literature. Newbery's innovations were so crucial to the formation of the genre that he is in fact known as the father of children's literature. The Newbery Medal, awarded each year to an outstanding work of American literature for children, was named in honor of him and his achievements. In the early 19th century, Hans Christian Andersen traveled Europe collecting and publishing fairy tales. Andersen is of course known for his great achievement, The Little Mermaid, which is still today a beloved story. The heroine of the story is herself memorialized in a statue in Anderson's native Copenhagen. 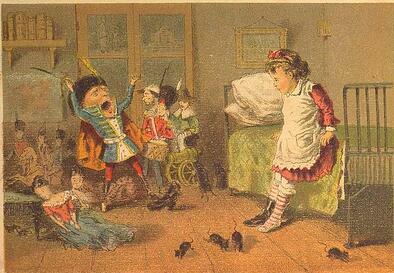 Some of Andersen's other stories that have made a lasting mark on literature are “The Emperor's New Clothes,” “The Snow Queen,” and “Thumbelina.” The Brothers Grimm also traveled the continent at this time, collecting the grittier versions of the fairy tales that made them famous. Swiss writer Johann David Wyss published his seminal work The Swiss Family Robinson in 1812. The novel, one of the first of its kind, was written with the goal of teaching children the importance of self-sufficiency while also entertaining them with a rousing tale of adventure. During this same time period, E.T.A. Hoffmann published his Kinder-Märchen collection of stories. The book contained the perennial Christmas classic “The Nutcracker and the Mouse King,” notable for it's imagination and fanciful plot. While magic had long been present in literature for children, this story blew open the doors in terms of possibility for wonder. And yet, the golden age of children's literature was still yet to come.